Last week was probably my most solid training week since my stress fracture, and I’m feeling pretty good about where I am. I ran 30.8 miles, biked 19.4, swam 1200 yds (that’s an estimate since I’m still struggling with lap count, but more on that later…), and I also got in two strength training sessions. Running-wise, I had my mile-repeats on Tuesday, an easy 6 on Thursday, and a 12-mile long run Sunday. Saturday I bricked my swim workout with another easy 6-mile run, which, happily, did actually feel easy. I’m still working to build my swim endurance, but my efficiency is improving and I’m definitely wasting less energy on my kick now. For Sunday’s long run I met Long Run Buddy in Central Park, which we had nearly to ourselves, thanks to the 14 degree temperature and frigid wind gusts. We bundled up and decided a legitimate warm-up was in order. After a shuffley mile we picked up the pace for our park loops. LRB had a 90-minute easy run in HR Zone 1-2 on his schedule, so we ended up pulling back a bit on the 8:30 pace I was targeting and settled in around 8:40. At mile 10 LRB peeled off at 92nd street to wrap up his workout, and it was at that point that sucked on my water bottle in vain and discovered that the nozzle had completely frozen. I do love winter running and generally don’t really mind the cold, but that seemed a bit much. Consoling myself that I could always eat snow if necessary, I got ready to push up the Harlem Hills the second time. I was nervous curious about how I’d do on the hills, especially on loop two, but I felt pretty strong throughout. I was definitely not able to push the pace as much as I was in the fall, but I’m confident that I’ll get the uphill speed back with a some focused time and effort. In any case, I still felt good endurance-wise, and I was able to pick up the pace for the last two miles. I finished my 12 in the park and still had about mile back to LRB’s apartment, and in an effort to stay warm I opted to just jog it back. All-in, I ran 13.8, which makes me feel much better about my 14-er coming up this weekend. After a hot shower the feeling returned to my fingers and nose, and LRB and I hit up a beer hall for some post-run sustenance. 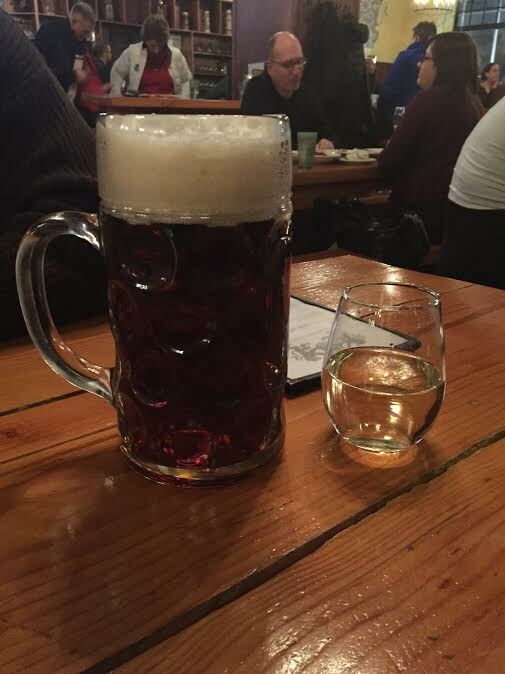 LRB’s liter o’beer and my teeny-tiny Riesling. Monday I was off work for the holiday and logged a 45-minute strength training session, 8 miles of HIIT interval biking, 3 loads of laundry, and some marathon cooking. My running bras are clean and my freezer is well stocked, so that made me a happy girl. We had our wine critic friend over for dinner last night which resulted in more imbibing than was perhaps prudent, especially given this morning’s intervals. I hit the treadmill feeling a bit sluggish and fought my way through 10×400’s at 6:40 pace. It was not my most stellar performance and I had to take a couple of my recovery intervals at a walk, but I gritted my teeth and made it through the full set. In fact, I know that I made it through because I used my snazzy new counting bracelet, which I made yesterday to keep track of my pool laps. 10 beads on the left. Count ’em. I was racking my brains all week trying to think of a low-tech solution, and I remembered that in my knitting travels I’d seen instructions for making row-counting bracelets. I dug around in my crafty bins and found some stainless steel beads, jump rings, and black cord and I was all set. I think the result looks moderately adult enough that I can wear it all day, and it worked beautifully for ticking off my intervals this morning. I’ll be trying it out in the pool tonight. The general idea is that the cords are a bit longer than the beaded area, leaving a short gap. The beads will slide along the cord, leaving a space between the counted beads and the ones ‘on deck,’ but there’s enough friction that they don’t slide around on their own. 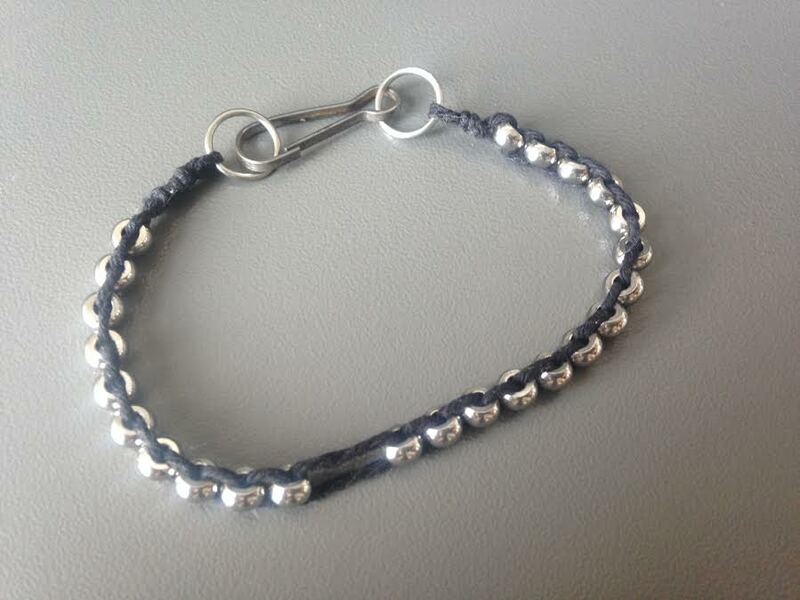 I’ll put up a separate post this week with the materials I used for my bracelet, along with instructions and photos. It’s a fast project and these would make a useful gift for your favorite runner or swimmer. (Or knitter.) These could range from masculine to feminine, simple and elegant to colorful and fun depending on your choice of beads and hardware. The only real constraints are selecting beads and cord of compatible size, and making sure your materials will survive the water if you plan to swim with it. I tend to gravitate towards minimalism, but you could easily incorporate number and letter beads for a personal touch, too—names, inspiration, a mantra, or PR’s.